#3......"THE OJUKA SITUATION" - BODIE 3.7 . you'll never walk alone ! You are welcome and thank you for looking. I'm loving the thought of a cozy Bodie . Thank you :) I like this ep even though it's a bit naff. You are very welcome...I must admit I like this episode too but it's lacking some more action for the lads together IMO. What a great photo! I particularly like the way Bodie's face is half in shadow and slightly turned away from us. thankyou so much . I'm so pleased that you like it . I do like this episode as an whole but i just wish the lads had some more action scenes together . Oh, they are both looking luscious here, I must say. And you do just expect them to turn to one another, any second. Thank you! thankyou . Yes they do look luscious and i had to choose between this image and another similar one were Doyle has his eyes turned towards Bodie so really they do end up locked in their own little world . 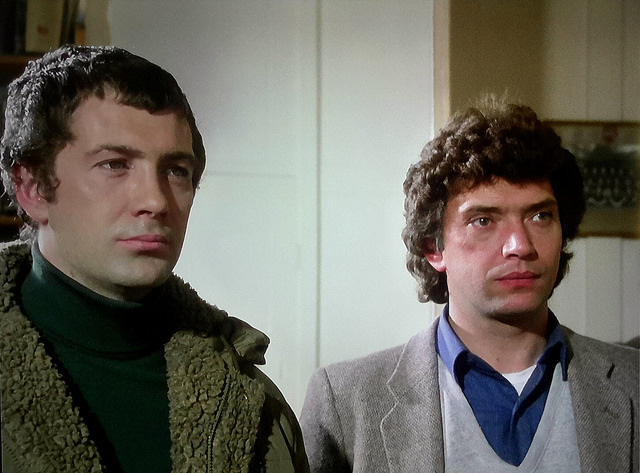 Aw, bless - Bodie all rugged up in a polo-neck and a fluffy jacket, and Doyle in four layers! Can they not think of other ways to keep warm? thankyou ....yes i know exactly what you mean , it's layer upon layer for the both of them though i must admit i do love Bodie in his fluffy jacket . I'm sure after the op is over they found a way of keeping warm....TOGETHER . oooh i do love him in his fluffy jacket . Lol! It looks toasty-warm but extremely disreputable! im sure if the chance arises he would wrap himself and Doyle in it . Me too , it sounds very promising. I love the episode and this is a wonderful picture of it. I always thought it is funny to see Doyle in a normal jacket and Bodie in the parka, but I think it suits them. thankyou and you are always very welcome. I like this episode too though i wish the lads had more action scenes together . I must admit i do love Bodie's green parka jacket , it looks very warm .